Allow users to reset their own passwords. Do you need to change the Primary Group for users? 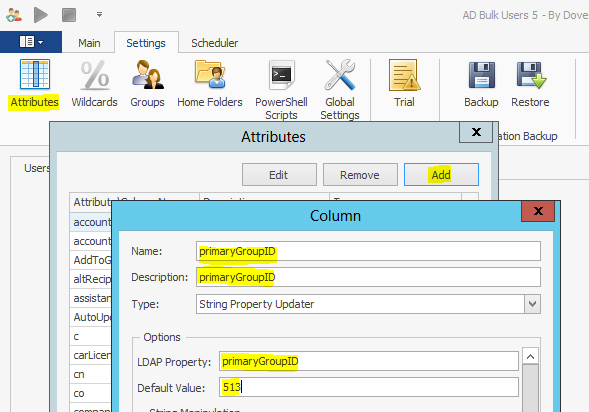 Which group is primary is stored in an attribute named primaryGroupID. The attribute primaryGroupID isn’t shown in AD Bulk Users by default so you’ll need to add it to the attributes list by click on the Settings tab and Attributes. 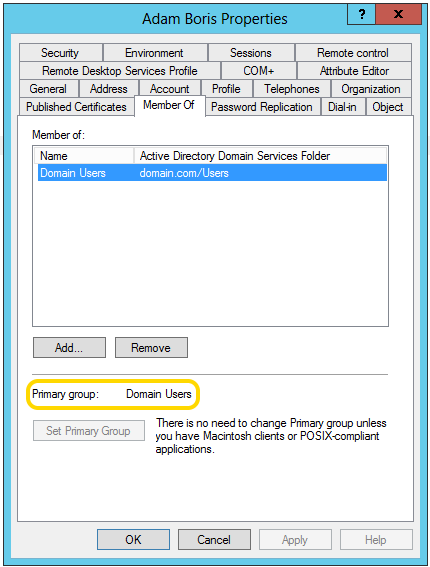 Note: Before the primaryGroupID can be changed the user must be a member of the group you are going to set as primary. If you do not know the value to use for the new group you want to set as the primaryGroupID you can find this in two ways. Using AD Bulk Export click ‘Add or Remove Columns’ and then ‘Add Column’ and type ‘primaryGroupID’ in the three boxes at the top and choose Integer. Then when you retrieve the users you will see the primaryGroupID. The second way to find the primaryGroupID, use AD Bulk Export with ‘Groups’ checked in the object type and look for the groups objectSid, the value to use as the primaryGroupID is the last octet of the sid 3368 in the example below. When you know the primaryGroupID, you can add it to your CSV file for use in AD Bulk Users, example below. Copyright 2005 – 2018 © Infoopia Inc.